Today had been set aside for Abydos, but last night we decided to postpone the trip until we were both feeling more lively. This morning however, Sam and I were both much better and over our early morning coffee on the roof terrace, with the tenth pylon tantalisingly close, we could feel Karnak Temple beckoning to us. Knowing what Karnak is like in the mornings when a sea of coaches descends on the car park and thousands of tourists cram into the temple, we waited until late morning to set off, Sam driving the car the short journey to get there. Sam has already seen all the changes over the last couple of years, but I hardly recognised the place as we pulled into a new parking area to the south of the temple. Here a new bazaar with stalls selling everything a tourist could want and much that they don’t need, lined the walkway towards the temple. The entrance is now through a new modern visitor’s centre where an impressive wooden model of the temples is set up in the middle of the huge hall. To one side, rows of seating offer a place for visitors to sit and watch a video of the history of Karnak before going in and around the walls there are many old excavation photographs and history boards. I have to say the authorities have done a good job here. We bought our tickets – now 65 EL – fended off a few local guides and set off across a sea of landscaped concrete paving towards the row of ram-headed sphinxes at the entrance. The area that used to be the old coach and caleche park is now an empty space from the temple all the way down to the river – much as it would have been in ancient times. The only thing I felt missing was the canal that would have once been there. In front of the temple a lot of clearance work has been done and the ancient quay, or tribune, has been uncovered. It would have been from here that the statue of Amun on his sacred barque was taken to Luxor Temple for the Opet festival by the river route. In other periods of history the god travelled by land down a route lined with the sphinxes which are currently being exposed right through Luxor. After going through security I looked towards the first pylon and could not believe how many people there were in the entrance. Even though we had left it until mid-day when it usually quietens down, I have never seen the temple so busy in all the years I have been coming here. Fortunately the thousands of people were all coming out, but I didn’t see how we would ever be able to get into the temple. Pushing against the crowd, Sam and I went straight to the fourth pylon where we wanted to have a look at some reliefs Sam had been reading about and we walked around the area of the fourth, fifth and sixth pylons in front of the Sanctuary of Alexander. Last time I was at Karnak, much of this area was closed off for restoration, so it was good to spend some time re-visiting the Tuthmose III and Hatshepsut monuments here. At some point Sam and I lost track of each other, so I went off to have a look at the rooms on the northern side of the Middle Kingdom court which had also previously been locked up. Today nobody stopped me, so my camera was working overtime. These rooms carved with reliefs of Tuthmose III, contain some very interesting scenes, particularly those depicting the hippopotamus hunt. I went on into the Akh-Menu, the festival temple of Tuthmose III. At least there were no changes here. By now Karnak was much quieter and I saw only a few visitors in these parts. After a look at the ‘botanical reliefs’ which are among my favourites, I went over the wall to the back of Karnak. I was hoping a guard would be around to let me into the little temple of Osiris Heka-djet and was amazed and delighted to find the gate open and nobody in sight. I spent a long time systematically photographing the walls of this little chapel built during Dynasties XXIII to XXV. Here the Divine Adoratrix Shepenwepet and Amenirdis are depicted before the deities in many interesting and often unusual reliefs. I lost track of the time as I picked my way carefully though the prickly camel thorn at the northern edges of Karnak, looking at the remains of each of the tiny buildings I found and trying to work out what they were. Walking back through the Temple of Amun about 15 minutes before closing time I realized that this area was again very crowded and people were still coming in. I wondered how people thought they could see Karnak in the quarter of an hour before closing. I had lost Sam hours ago, but she was waiting at the car when I got back to the car park, having given up the battle with the crowds a while ago. We hadn’t really eaten much over the past couple of days, so in the evening Sam and I treated ourselves to another great meal at Maxim’s and later still went to the Horus coffee shop in the bazaar. We had intended to walk the couple of kilometers home to the Villa Mut, but as it was midnight by then, a friend insisted on giving us a lift and wouldn’t take no for an answer. Breakfast consisted of a very lazy morning with several cups of coffee on the roof terrace of the Villa Mut. It’s a lovely roof, part shaded by a colourful awning. There are several tables, upholstered chairs, sofas and sunbeds made from cane, a tall fridge full of soft drinks and even a tiny plunge pool, though empty at present. The villa overlooks the high mudbrick wall that surrounds the whole of the Precinct of Mut (pronounced ‘Moot‘) and from the roof we could see all the little groups of temple buildings which used to be partly hidden by scrubby grass and camel thorn. Though I have visited the temple many years ago, it has been officially closed since the 1970s while excavations and restorations are taking place. My memories of the Mut Precinct are hazy and while I recall many statues of the lion-headed goddess Sekhmet and one or two other scattered blocks with reliefs, no overall plan of the temple was fixed in my mind. So it was exciting to see the whole area laid out before us and from the height of the third story roof terrace we could even see clearly the shape of the vivid green, crescent-shaped sacred lake, ‘Isheru‘. To the west of the lake are the remains of a temple of Rameses II, with large deep hieroglyphs engraved into the stone of the low rear wall. Beyond the lake, towards the north I could see several tall round columns that I don’t remember and it looks like much of the main part of the Mut Temple have been cleared or rebuilt. And Sekhmet is still there, hundreds of sisterly look-alikes lined up on the edges of a large square area in various stages of ruin. It looks like the excavators might be here at present as I could see several little clusters of people moving around. Beyond the Mut Precinct I could see the huge gate of Karnak’s Tenth Pylon and above the trees, the top of Hatshepsut’s obelisk. Last night we listened to the music and dialogue from Karnak’s Sound and Light show – three times in different languages, though the coloured floodlights were hidden behind the trees. Today the sun is shining and to the west I could just make out the peaks of the Theban Mountains in the hazy light across the river, above the houses that surround us. 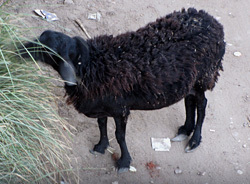 Local people came and went along the dirt track in front of the villa, mostly donkey-carts and motorcycles and a little flock of scrawny goats picking at the rubbish on the roadside mingled with a few woolly black sheep nibbling at the long grass. Because the large area of the Mut Precinct acts as a buffer zone, everything seems to be at a distance and muted, including traffic noise from the nearby flyover that leads to the airport road. It felt very peaceful after Cairo. Most of the day was spent relaxing on the roof. Rachad the villa’s owner, came and went a few times delivering one or two things that we had asked for, including an iron and ironing-board. I asked about the internet connecton we were spposed to have and he tried to connect, then after a phone call he told me that the D-Link service provider was down and should be back soon. Later the electricity went off for a while and the villa was in darkness so Sam & I took the opportunity for a siesta. In the evening we went for dinner at Maxim’s near the Isis Hotel and Abdul and one of his brothers came too so it was quite a little party with the usual great food. We discussed the trips we wanted to do while we were here. Driving through Luxor I could see some of the massive changes since I was last here and it seems like half the town has gone, with wide roads replacing little narrow streets. Luxor is beginning to look very smart but I think it will lose its charm and character. The Corniche now has several sets of traffic lights and is lit by millions of tiny blue LED lights that are draped over every tree. There is also a new one-way system that means driving anywhere in Luxor takes three times as long. After dinner we went to the Horus coffee shop in the bazaar and stayed until 12.30am. Sam and I were of course the only women in this local café where rows of men sat at the little metal tables and drank tea, smoked shisha and played noisy games of dominoes or towla, an Egyptian form of backgammon. They seem to get very excited by this and there is a great deal of friendly (and not so friendly) shouting and bantering. Another brother of Abdul’s came by to say hello and we sat chatting and generally watching the world go by. Walking along the road I found a bank that was still open late at night and I finally managed to change some money, so I feel solvent again. By the time we left I was feeling very chilled in the cool night air and I was glad to finally get to my warm comfortable bed back in the Villa Mut.